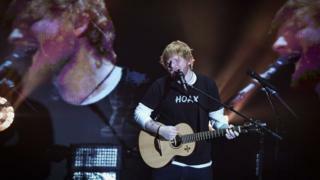 Investigators have found the wildlife pond on Ed Sheeran's estate was not being used as a swimming pool to support a "wild lifestyle". The pond was built at his Suffolk home in 2017 on condition it was not for recreational activities. But Suffolk Coastal District Council officers visited after photographs emerged of the pond showing steps, a handrail and a jetty. A spokesman said there was "no evidence that it is not a wildlife pond". Neighbours had previously raised concerns the development, granted permission in January 2017, was to support "a 'wild lifestyle' rather than actual wildlife". An enforcement investigation followed last year, prompting a fresh planning application which said the jetty and steps were "to form interest" and allow for maintenance and emergency access. Nearby homeowners said earlier this month they had "no problem with Ed Sheeran whatsoever" since the new permissions had been granted. The investigation at the estate near Framlingham was prompted by national newspapers questioning the pond's use. A council spokesman said: "There was no evidence that it is not a wildlife pond, as plants are growing in and around it, or that the planning conditions had been broken." Plans to build a Saxon-style chapel on Sheeran's estate were rejected last year after a wildlife group voiced concerns about the possible impact on great crested newts.